Over the span of 12 years, Gimeno has been diagnosed with chronic autoimmune diseases and mental illness. At 18, she was diagnosed with bipolar disorder. At 19, 24, 26, and 30, she was diagnosed with polycystic ovarian syndrome and myasthenia gravis, followed by asthma and psoriasis. Growing up, Gimeno had a happy childhood, but there were moments as early as 8 years old that seemed to paralyze her. The moments became more common as she got older, Gimeno said. Faith and family have always played major roles in Gimeno’s life. An only child, she was the youngest of 15 grandchildren and, at one point, lived next door to her cousins. Her uncle would often host family gatherings and barbecues, even if there wasn’t a special occasion to mark the celebration, but her family did not discuss mental health. Gimeno felt she had to navigate that part of her life alone. Gimeno continued to excel in school while struggling with mental illness and finding the right tools to cope. During her senior year in high school, Gimeno reached out to her parents for help. She graduated in the top percentile of her school and gave the commencement address as well as writing for the school paper, competing on the debate team, and other extra curricular, but she didn't get the help she needed, she said. Gimeno said her parents didn't think she was actually depressed because she was suceeding. "[My mom] said it was because she didn't understand how someone who was doing so well in school could possibly be depressed," Gimeno said. It wasn’t until the news of a friend’s suicide that Gimeno was able to reflect and take control of her own mental health. At the time, Gimeno was a freshman at the University of Illinois. She recalls missing a week of classes in order to grieve. During that week, she went to the library to research bipolar disorder — the illness her friend had been diagnosed with — and as she read through the signs and symptoms, everything made sense. Gimeno went to the campus mental health center, where the psychiatrist diagnosed her with type two bipolar disorder. She asked the psychiatrist to call her parents because she was nervous about their reaction. “It’s important to tell people to get help," she said. "You can’t change other people, you can only change yourself." After transferring to Northwestern University, Gimeno co-founded an organization to help students with mental illness. These efforts were the beginning of her journey in mental health advocacy. “I spoke to hundreds of students on campus about not having shame and seeking help for bipolar disorder and depression,” she said. Gimeno also went on to compete for the speech team on campus, becoming a state champion and a national semi-finalist. The experience taught her how to communicate with her professors while keeping the dialogue on mental health open. In 2006, Gimeno graduated from Northwestern University at 22 with a bachelor’s degree in both communications and political science. After graduating, she began working on her applications for law school and writing a book a professor encouraged her to write offering resources to students who want to finish their education while dealing with bipolar disorder and depression. Two years later, her dreams came to a standstill after she was diagnosed with myasthenia gravis, a chronic autoimmune neuromuscular disease. “Everything changed overnight. I went from doing yoga five days a week to not being able to feel my legs in months,” she said. Gimeno remembers falling down a flight of stairs one day and losing control of her body. She couldn’t feel anything below her legs. “Where are my quadriceps, I know I brought them when I left the house this morning,” Gimeno said, joking. A few weeks later, she was hospitalized in critical condition, went through multiple surgeries and was bedridden for a year. “One of the hardest things about being ill is when a person is forced to give up on the goal,” she said. Gimeno has been using a cane for her myasthenia gravis for the past six years, and has seen firsthand the misconceptions and stereotypes that continue to exist for those who have both visible and invisible illnesses. “We need a greater diversity of stories in pop culture and the news that portrays the whole spectrum of mental illness,” Gimeno said. According to the National Alliance on Mental Illness, 43.8 million adults experience a mental illness in any given year, and one in five adults will be affected with a mental health condition in their lifetime. According to the API Population Report by the California Department of Public Health's California Reducing Disparities Project, Asian Americans, Native Hawaiians, and Pacific Islanders may be more reluctant to seek help due to the stigma of mental health, language barriers, lack of culturally sensitive and competent services, and lack of access to care. Emily Wu Truong, vice president of multicultural outreach at NAMI San Gabriel Valley and the chair of the Asian Coalition, hopes the conversation surrounding mental health will continue beyond Mental Health Awareness Month. “I’ve learned from NAMI that there is no health without mental health,” Truong told NBC News. For years, Truong has organized a series of workshops and events to remove the stigma of mental health in the Asian-American community. Topics have included how to support a loved one in a mental crisis, the culture of mental health, and the importance of community support and culturally sensitive training and resources. Truong was officially diagnosed with depression and anxiety in 2013. 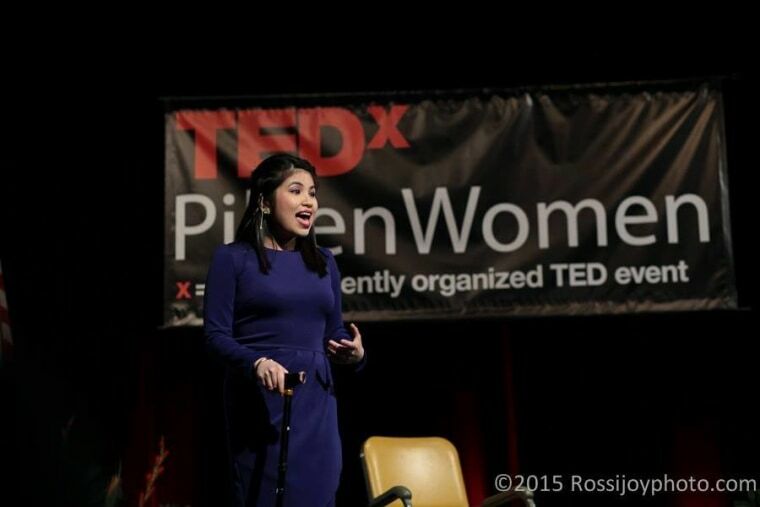 Her mental illness hindered her progress and almost halted her dreams of becoming a motivational speaker, she said. Truong decided to “come out” about her mental health journey during a public Asian-American legislative briefing on mental health in July 2013. She continues to share her story, producing a PSA in both English and Mandarin with the L.A. County Department of Mental Health in 2014. “I stood up for my first time to publicly state, 'I will not end my life because I have a story to share. The more we talk about mental health, the more we will alleviate the stigma. There is no shame, there is no shame," she said. Shortly after her myasthenia gravis diagnosis, Gimeno resumed her mental health advocacy work at the Balanced Mind Foundation and focused her attention on the book she was hoping to publish. While at the foundation, Gimeno worked on a mental health podcast geared towards young adults. One day, a person called for help because she was having suicidal thoughts. That person told Gimeno that she was not suicidal because she had depression, but because she had a combination of depression and lupus, a chronic autoimmune disease. Gimeno realized there were not many resources or support for individuals who juggled both chronic physical pain and mental illness. During that call, Gimeno shared her personal story and told her that she also had multiple autoimmune diseases in addition to bipolar disorder. “She did not kill herself after I shared part of my story with her,” Gimeno said. “One of the reasons I started Fashionably Ill is because there needed to be a place for people who are living with a psychiatric illness, depression, bipolar disorder, and a chronic pain conditions, to go to,” Gimeno said. The website offers resources and information about the sudden physical changes in appearance or appetite due to medication or how someone can get stuff done when they're depressed. It fills a void that Gimeno had when she was younger, trying to navigate the mental health system alone. Gimeno decided to create her own tools to help others manage their mental health by curating the “Depression Toolkit,” a newsletter that includes 10 strategies for accomplishing objectives when you’re depressed, a topic she highlighted during her first TEDxTalk last year. For Gimeno, laughter is the best medicine. She tackles the subject of mental health by injecting humor into her routine hospital check-ups. Since most of her time is spent at hospitals, she decided to “vacationize” her visits. “I have this thing where I started wearing leis to my hospital visits and putting a flower on my hair, basically bringing the vacation to the hospital using humor,” she said. Gimeno also introduced her “hospital daycation” idea to other women balancing chronic pain and mental illness. She has provided makeovers to women who spend a majority of the time in the hospital. “I do believe in having a sense of humor, it’s a good coping mechanism,” she said. While anti-stigma campaigns are important, it is also important to emphasize the need to provide more concrete and practical solutions, Gimeno, who is scheduled to speak at the Minority Mental Health Awareness Summit in July, said. Today, Gimeno is a consultant, currently collaborating with Rutgers University and the University of Massachusetts Medical School to develop a manual to help young adults with mental illness find meaningful employment. Gimeno also hopes to resume her dream of seeing her book on mental health published. She hopes that it will be a reminder for those going through mental health struggles to continue to fight and pursue their dreams.